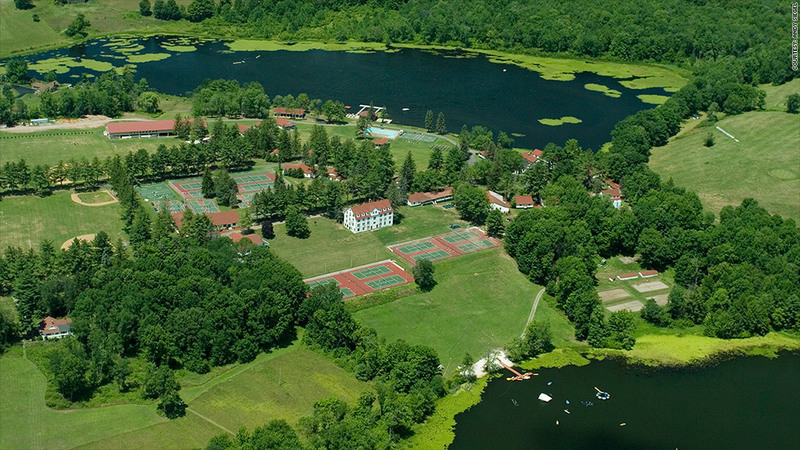 Tyler Hill, a sleep-away camp in Pennsylvania, will charge campers $12,350 to attend next summer. Before we begin, let's establish that we aren't talking about the sticky Bug Juice-laden camps of your youth. These camps are funded by parents used to getting the best. The soul of the camp experience hasn't changed, according to Andy Siegel, owner of one of the ritzier sleep-away camps Tyler Hill. The bunks are still without air-conditioners. Kids are still learning how to water ski and serve tennis balls, how to make s'mores and friendship bracelets. But now, Siegel said, Tyler Hill and similar camps mix in spin classes, media arts tutorials, yoga, cooking lessons and mixed martial arts. And those updates end up costing a heck of a lot more money. Camp is in session for about seven and a half weeks. That's seven and a half weeks of mostly tech-free entertainment, where kids are playing actual sports (not Wii), making real like art projects (not through an app) and talking to one another face-to-face (instead of over FaceTime). But all the new activities require new staff members and different facilities. Most camps cost upwards of $10,000, peaking at more than $12,000. Tyler Hill's tuition for summer 2015 will be $12,350, up from about $8,500 in 2005. That's $2,000 more than if it had just kept pace with inflation. Summer at Camp Vega, a posh all-girls camp in Maine, cost $11,600 in 2014, up from $8,400 in 2004. Campers pay extra for figure skating and horseback riding. Kids can't head to camp without new clothes. They need to be at least as on trend as their bunk mates, or else they'll be outcasts in their outdated cutoff shorts, which are so last summer. Many camps require uniforms, so they need to go to specialty stores that sell camp-branded apparel. A camp wardrobe can cost close to $2,000 for a kid's first summer, and another $1,000 each year after that. The money hemorrhaging doesn't stop with uniforms, though. The 25 pairs of underwear and socks, lacrosse stick, fans, hockey skates, bedding, gymnastics leotards, cleats, nail art kits, and Color War costumes all add up to at least another $500. Visiting day has turned into a battle ground of parents trying to one-up each other, according to several parents we spoke to. Who brought their kids the most candy, and the most lavishly-wrapped packages? The 'it' gift? And of course, who can look the best bringing it all? It's not that the items that are so extravagant, it's the amount they are bringing. "I got to camp and it was just so out of hand," said Amy Selling, a lifestyle blogger who has witnessed the madness firsthand at her son's visiting days the past two years. "I saw one grandmother carrying three huge bags with gigantic candy packages that probably cost $150 each." She said there are kids with 100 Baked by Melissa mini cupcakes, thousands of pieces of candy, sushi from Nobu and pizza from New York City. Mind you, most of the camps confiscate any food item not eaten within a day. Selling said she's seen parents bring brand new $250 sneakers for their kids to ruin in the remaining three and a half weeks at camp, and glitter tattoos made to look like $4,000 Van Cleef & Arpels bracelets. The moms are under additional pressure for who can look the most effortlessly camp-chic. That's why Selling said some raid Madison Avenue and work with personal shoppers to pick the right outfit and, of course, get their hair blown out the day before. It's safe to say parents can spend anywhere from $200 to $800 on visiting day treats alone. Add to that the two-night hotel stay and wardrobe, another $750. In total, on the low end, we're talking about $12,500. But the number can top $16,000 for just about 50 days. Let's gather round and sing "Kumbaya" to that.